Cowichan is a region on Vancouver Island in the Canadian province of British Columbia. Ludwig van Beethoven (1770-1827) was a German composer. Put them together and you get a promotional video. It is not the Rifftides custom to present promotional videos, so please do not send yours unless it is this brilliant, melodic, mouthwatering and noncommercial. Let’s all move to Cowichan. Thanks to friend Hal Strack for alerting me to the Cowichan video. Brigadier General Strack, United States Air Force (retired), was a lifelong friend of Paul Desmond. 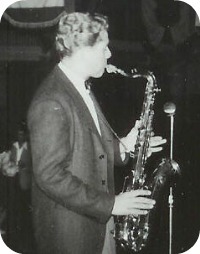 Early in their pre-military careers he worked as a tenor saxophonist in bands with Paul. In an illustration from Take Five: The Public and Private Lives of Paul Desmond, he’s pictured here in 1941 playing a solo. He told me that the song was “Singing The Blues.” Without Hal as a resource, my biography of Desmond would have been significantly thinner. See the 19 Strack entries in the index of the book. Incidentally (ha), Take Five is now available as an ebook, complete with index and all the photographs. I watched it twice. That part of the world is so beautiful. I am ready to move. My wife is not quite ready to move, so we have to negotiate. Wow, what a presentation. Really very nice how they integrated the various musicians of every genre playing Beethoven’s theme. When I saw the silhouette of the trumpeter, I was immediately wishing that they had somehow kidnapped their well known neighbors, Ingrid and Christine Jensen, from Nanaimo which is 60 km north of Cowichan and inserted them into the mix as well. But then, that might have sparked a rivalry between the two entities, ¿no? Anyway, next time we are in Seattle, we will have to make it a point to hop over and visit Cowichan for a day or two. Thanks for posting this very informative and appealing presentation. The Cowichan valley has been home to the Dwyers since the 1880s. I am currently living ‘up island’ but there are many generations worth of family history in that beautiful locale and it’s great to see the natural bounty of the area being used for something other than logging!! (even though logging paid our way in the world up until I decided to break the tradition and go in to the jazz ‘business’). The soprano player in the film is an old colleague of mine, Wayne Kozak, and the string quartet featured briefly is the wonderful Emily Carr Quartet from Victoria (just to the south). It’s an amazing spot, home to some wonderfully unique micro-climates which allow for the burgeoning wine industry in the area. Mr. Dwyer is a tenor saxophonist. He lives in Qualicum Beach, BC. He has the first solo in this three-saxophone version of John Coltrane’s “Giant Steps,” followed by Rémi Bolduc and Jerry Bergonzi.